We hope it will be helpful for anyone who finds their anxiety is a problem - but also for any friends and relatives who want to understand more about it. But if you feel anxious all the time, or for no obvious reason, it can make life difficult. Anxiety feels like fear. When it's there a lot of the time, caused by a problem in our life that can't be solved, like money difficulties, we call it worry. If it is a sudden reaction to a threat, like looking over a cliff or being confronted by an angry dog, we call it fear. physically - they make our body ready for action - to run away from danger or to attack it - the 'fight or flight' response. These feelings become a problem when they are too strong or when they carry on even when we don't need them anymore. They can make you uncomfortable, stop you from doing the things you want to - and can generally make life difficult. the things that make us anxious - "my work is stressful"
our anxious reaction to them - "I feel really stressed out". This can make things confusing, so we don't use this term much in this leaflet. Isn't anxiety/stress bad for you? Some anxiety is good for you. It keeps you alert and can help you to perform well. But only some. If it gets too intense, or goes on for too long, it can make you feel bad and interfere with your life. It can make you depressed and damage your physical health. It's easy to worry that these feelings are the signs of a serious physical illness - and this can make the symptoms even worse. When anxiety and panic go on for a while, it's easy to start to feel depressed - you start to feel down, lose your appetite and see the future as bleak and hopeless. Anxiety seems to take three main forms, but they overlap and most people will probably experience more than one type. You have the symptoms of anxiety most of the time. short of breath and that you are choking. About a quarter of people who go to an emergency department with chest pain thinking that they may be having a heart attack are actually having a panic attack. Although the symptoms are much the same as those for GAD, they are much more powerful and only last a short time. You feel really frightened of something that is not actually dangerous and which most people do not find troublesome. The nearer you get to the thing that makes you anxious, the more anxious you get ... and so you tend to avoid it. Away from it you feel fine. social phobias - a fear of being with other people - which can make it hard to talk to other people. About one in every ten people will have troublesome anxiety or phobias at some point in their lives. However, most people with these problems never ask for treatment. What causes these kinds of anxiety? Some of us seem to be born a bit anxious - research suggests that it can be inherited through our genes. However, even if you aren't naturally anxious, you can become anxious if you are under enough pressure. A psychological explanation suggests that, for some people, it is because they start to believe that the physical symptoms of mild anxiety are symptoms of serious physical disease. This makes them worry more, so the symptoms get worse, so they worry more ... and so on. Sometimes it is obvious what is causing anxiety. When the problem disappears, so does the anxiety. However, there are some circumstances that are so upsetting and threatening that the anxiety they cause can go on long after the event. These are often life threatening situations like car crashes, train crashes or fires. If this happens to you, you can feel nervous for months or years after the event, even if you weren't physically harmed. if you have been abused, persistently mistreated or tortured as an adult. This is part of post-traumatic stress disorder. Street drugs like amphetamines, LSD or Ecstasy don't help. Even the caffeine in coffee can be enough to make some of us feel uncomfortably anxious! Many mental health problems can make you anxious. 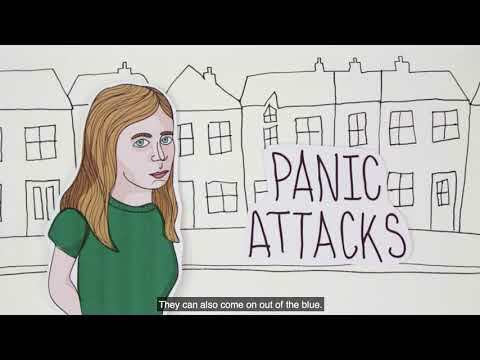 About half the people with depression get panic attacks at some point. Some physical problems, like thyroid disease, can make you feel anxious. On the other hand, it may not be clear at all why you feel anxious. It's a mixture of your personality, the things that have happened to you, or big changes in your life. Anxiety is very common and many of us overcome it or cope with it without professional help. However, if it is severe or goes on for a long time, anxiety can affect your physical and stop you doing the things you want to do. The good news is that there are ways to help yourself. Talk about it. This can help when the anxiety comes from recent knocks, like a partner leaving, a child becoming ill or losing a job. Who should you talk to? Try a friend or relative who you trust and respect, and who is a good listener. They may have had the same problem themselves, or know someone else who has. Self-help groups. These are a good way of getting in touch with people who have similar problems. They can understand what you are going through. As well as having the chance to talk, you may be able to find out how other people have coped. Some of these groups are specifically about anxieties and phobias. Others may be for people who have been through similar experiences - women's groups, bereaved parents' groups, survivors of abuse. Learning to relax. It sounds too obvious - surely everyone can relax? But if your anxiety just won't go away, it can be really helpful to learn some special ways of relaxing, to be a bit more in control of your anxiety and tension. You can learn these through groups, with professionals, but there are several books and self-help materials you can use to teach yourself. It's a good idea to practice relaxation regularly, not just at times of crisis. Using a self-help book. This works well for many people. Most of the books use the principles of Cognitive Behavioural Therapy (CBT) - see below. Someone with troublesome anxiety or may not talk about their feelings, even with family or close friends. Even so, it is usually obvious that things are not right. The sufferer will tend to look pale and tense, and may easily be startled by normal sounds such as a door-bell ringing or a car's horn. They may be irritable and this can cause arguments with those around them, especially if they don't understand why the person feels that they cannot do certain things. Although friends and family can understand the distress of an anxious person, they can find them difficult to live with, especially if the fear seems unreasonable. If you have an anxiety problem which just won't go away, you may not ask for help because you worry that people might think that you are "mad". They won't. It's a common problem and it's much better to get help rather than suffer in silence. This is a talking treatment which can help you to understand how some of your 'habits of thinking' can make anxiety worse - or even cause it - and come to terms with reasons for your anxieties that you may not have recognised yourself. The treatment can take place in groups or individually, and is usually weekly for several weeks or months. There are now a number of computer programmes which you can use to give yourself CBT. The National Institute for Health and Care Excellence (NICE) recommend a programme called 'Fearfighter' for panic or phobia. You can get this through your GP. If this is not enough, there are several different kinds of professionals who may be able to help - the GP, psychiatrist, psychologist, social worker, nurse or counsellor. Psychotherapists may or may not be medically qualified. Medication can play a part in the treatment of some people with anxiety or phobias, The most common tranquillisers are the valium-like drugs, the benzodiazepines (most sleeping tablets also belong to this class of drug). They are very effective in relieving anxiety, but they are also very addictive after four regular use. When people try to stop taking them, they may experience unpleasant withdrawal symptoms which can go on for some time. These drugs should only be used for short periods, usually up to 2 weeks, perhaps to help during a crisis. They should not be used for treatment of anxiety. They should not be used at all in panic disorder. Antidepressants can help to relieve anxiety, as well as the depression for which they are usually prescribed. They usually take 2 to 4 weeks to work and have to be taken regularly to work properly. Beta-blockers in low doses can sometimes control the physical shaking of anxiety. They can be taken shortly before meeting people or before speaking in or having to perform. Studies suggest that Valeriana officinalis () does not seem to be helpful in anxiety, although Matricaria (German chamomile) and Melissa officinalis (lemon balm) 'show promise' Piper (kava) does seem to be but is currently banned in the UK because of worries that it can cause liver damage. self-help (books based on CBT principles). Most children go through times when they feel very frightened about things. It's a normal part of growing up. For instance, a toddler will be very attached to their parents or the people who look after them. Separation from them, for any reason, can make them very anxious and upset. Many children are scared of the dark or of imaginary monsters. These fears usually disappear as the child grows older, but they do not usually spoil the child's life or interfere with their development. Most will feel anxious about important events like their first day at school. Once it is over, the child stops being frightened and is able to get on and enjoy the new situation. Teenagers often feel anxious. They tend to be worried about how they look, what other people think of them, how they get on with people in general, but especially about forming close relationships. These worries can usually be helped by talking about them. However, if they are too strong, other people may notice that they are doing badly at school, behaving differently, or feeling physically unwell. If a child or teenager feels so anxious or fearful that it is spoiling their life, it's a good thing to ask your GP for advice. Anxiety UK: Helpline: 08444 775 774; email: support@anxietyuk.org.uk. Charity formed 30 years ago by a sufferer of agoraphobia for those affected by anxiety disorders. Tel: 0161 705 4306; email: babcp@babcp.com. Has a UK register of accredited therapists. No Panic: Helpline: 0844 967 4848; Youth Helpline: 01753 840393 (13 to 20 year olds); email: admin@nopanic.org.uk. National Organisation for Phobias , Anxiety, Neurosis, Information andCare. Support for sufferers of Panic Attacks, Phobias, Obsessive Compulsive Disorder, Generalised Anxiety Disorder and Tranquilliser Withdrawal. An Introduction to Coping with Phobias by Brenda Hogan, Constable & Robinson. Barr Taylor, C. (2006) Panic disorder. BMJ: 332: 951-955. Cohen, A. (2008) The primary care management of anxiety and depression: a GP’s perspective. Advances in Psychiatric Treatment, 14: 98-105. Ernst, E. (2007) Herbal remedies for depression and anxiety. Advances in Psychiatric Treatment, 13, 312–316. NICE (January 2011) Generalised anxiety disorder and panic disorder (with or without agoraphobia): Management in primary, secondary and community care: Quick Reference Guide. NICE (2008) Computerised cognitive behaviour therapy for depression and anxiety. Review of Technology Appraisal 51. National Institute for Health and Clinical Excellence: London. Sareen, J. et al (2006) Disability and poor quality of life associated with comorbid anxiety disorders and physical conditions. Archives of Internal Medicine, 166, 2109–2116. Scott, A., Davidson, A. & Palmer, K. (2001) Antidepressant drugs in the treatment of anxiety disorders. Advances in Psychiatric Treatment, 7, 275–282.